We’d say it’s had a good run, but we’d be lying. Seeing how probably more than half the hundred million DS units sold so far are Lites, it’s had a eye-wateringly spectacular run. And despite Nintendo’s promise to keep it on hand alongside the 3DS and the fact that stripping the GBA slot out of the DSi and XL inadvertently made it slightly more relevant, we all know it was out way past its bedtime. Gamestop is making the first move, but we’d be more than a little surprised if the rest of the major retailers don’t follow suit. 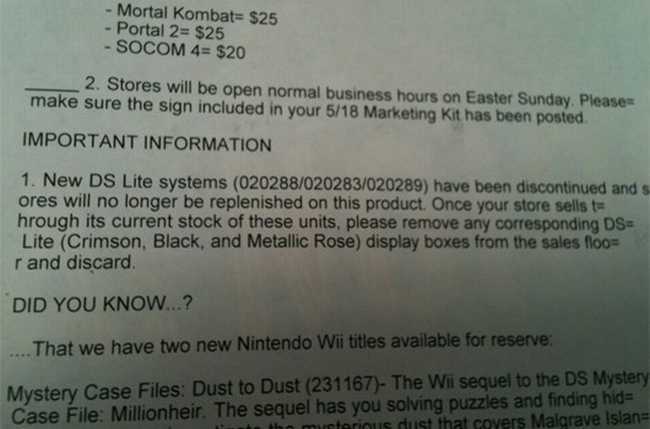 Crimson, Black, and Metallic Rose displays will be taken down when stock ends as well. With a new Wii, DS and PSP on the horizon, this just about has the makings of the end of an era. It would probably feel more like it if all the new consoles didn’t all look the same and have pretty much the same names, though. Pour one out for the DS Lite, it was one of the greats.